A down night for HAWAII 5-0. CBS: MACGYVER dipped 0.1 to 0.7, and HAWAII 5-0 dropped 0.2 to 0.7. 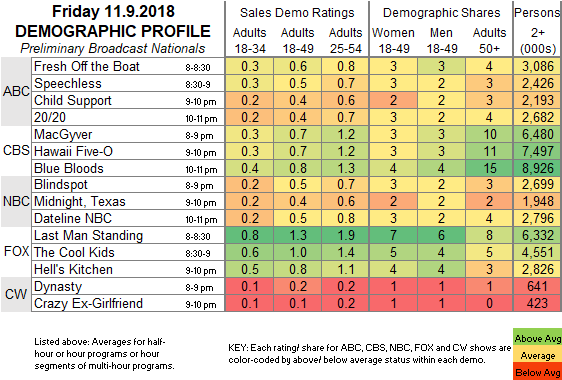 BLUE BLOODS was steady at 0.8. ABC: FRESH OFF THE BOAT (0.6), SPEECHLESS (0.5) and 20/20 (0.4) were steady. CHILD SUPPORT lost 0.1 to 0.4. NBC: BLINDSPOT gained 0.1 to 0.5. MIDNIGHT TEXAS (0.4) and DATELINE (0.5) held last week’s numbers. FOX: LAST MAN STANDING (1.3), THE COOL KIDS (1.0) and HELL’S KITCHEN (0.8) were all up 0.1. CW; DYNASTY rose 0.1 to 0.2, and CRAZY EX-GIRLFRIEND stayed at 0.1. Tonight’s SATURDAY NIGHT LIVE is hosted by Liev Schreiber, with musical guest Lil Wayne. On Sunday, there are finales for TNT’s THE LAST SHIP, Lifetime’s YOU and Showtime’s KIDDING, as well as a premiere for HBO’s British import SALLY4EVER. ABC airs the pre-CMA AWARDS interview special COUNTRY MUSIC’S BIGGEST STARS.